Diverse groups of women work together to help breast cancer patients. Every year Home League and League of Mercy members of The Salvation Army South America East Territory work hard to prepare for Breast Cancer Awareness Month, which takes place annually in October. They make and distribute cushions in the major cancer hospitals throughout the country. However, this is not just any cushion—it is specifically made with its format, structure and texture designed to mitigate the discomfort felt by women who have recently had breast cancer surgery. “Many women throughout the three countries that comprise this territory [Argentina, Paraguay and Uruguay] benefitted this year from receiving these cushions, but one story stands out for the way in which the Lord brought together totally different groups of people to benefit women dealing with breast cancer in Buenos Aires,” said Major Roxana Dinardi, Buenos Aires Divisional Director of Women’s Ministries. The Buenos Aires Advisory Board invited Women’s Ministries to talk about the “heart cushions” at one of its meetings. It so happened that one of the members had also invited representatives from the Ministry of Justice to the meeting, to speak with some members of the Army regarding accommodation for women leaving prison. The subject of the heart cushions led to conversation between the advisory board and the the Ministry of Justice representatives, who work with inmates serving time at Ezeiza’s Complex number 4 for women in Buenos Aires. This prison has a large area for the women to work and produce things, and they were willing for the inmates to help make the heart cushions. Arrangements ensued for a group of officers from the division to go to the prison the following week to talk about the project and motivate the women to get involved. 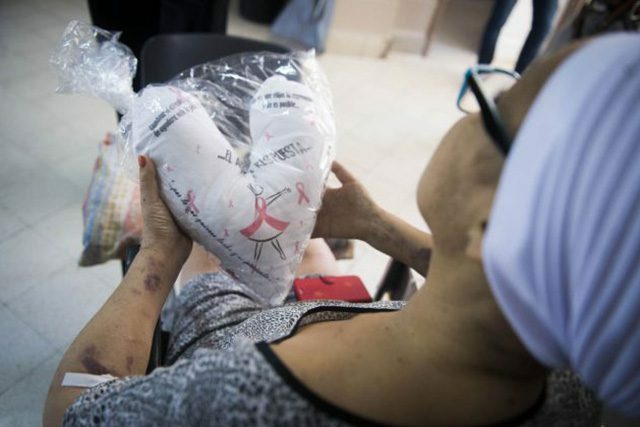 “What actually happened was that when they got there not only were the ladies already making the hearts, but they themselves in another workshop in the prison had printed their own material for the cushions with sentences containing words of hope and love for the ladies with cancer,” said Dinardi. The prisoners produced 100 heart cushions for the hospital. “This was so significant to us, as it allowed us to be part of a process of social awareness, symbolically opening a door through the prison walls to the women that had been through surgery due to cancer—two completely different types of women united through a cushion,” Dinardi said. The Marie Curie Cancer Hospital in Buenos Aires received these heart cushions. Through contact with the Advisory Board other organizations got involved. Students of the Julio Bocca Foundation (Dancing School) organized a flash mob that popped up on every floor of the hospital during that day. Racing Solidarity Foundation (Soccer Club) delivered greetings and words of encouragement to hospitalized women from famous football players; others came in person and signed autographs. Well-known television stars recorded videos with words of hope to be played to outpatients. The Director General of the Hospital gave a special word of thanks to The Salvation Army and all its partners. 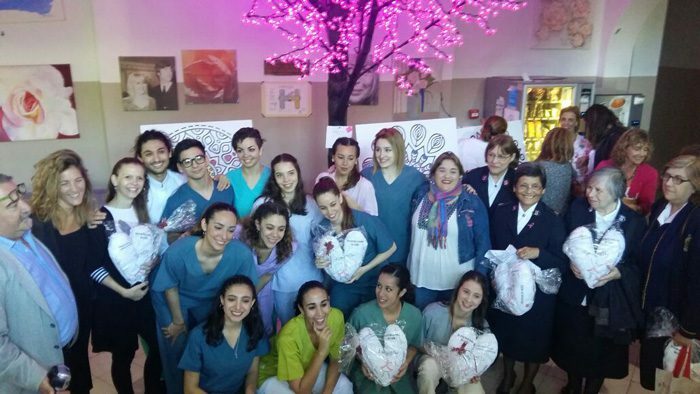 A total of 130 heart cushions were distributed to patients with a lot of love, music, color and hope. However, it did not end there. The following week a group of officers took videos, photos and drawings from the hospitalized women who had received heart cushions to the women in prison. The Salvation Army thanked them for their work of love. Although these women at this point in time are deprived of their freedom, they were able to feel part of the happiness that participants shared as they worked together to benefit others. They also watched videos produced at the hospital thanking them for their kind gesture. “For us Salvationists it was a great honor to be able to bring together different organizations that usually have nothing in common, and to be able to be a bridge that brought together in an act of love women who are suffering, some because of what they have done in the past, others because of illness,” Dinardi said. “We thank God for the doors that he opens to bring diverse people together for common good. It reminds us that he is still in control, and that human hearts are still tender toward the suffering of fellow human beings, which gives us, his people, an excellent opportunity to forward his mission.